Ban Laem Sor takes its name from the small beachside village that surrounds it. As soon as you enter the villa you feel you are in a frequently visited family holiday home: the bedroom configuration (two kings, a queen and a twin), the facilities and the villa’s location all endorse its suitability for families. Although the courtyard is a little bare, it makes a good safe enclosure for toddlers to run around and let off steam, and the poolside area, while not vast, is plenty wide enough for everyone to find their own space. Having the beach so close provides another ideal option for daytime pleasures, active or otherwise. A shady read on the sofa in the open-sided <i>sala</i> (gazebo) is also a fine way to relax, and the 10-metre-long swimming pool is perfect for regular cooling dips. 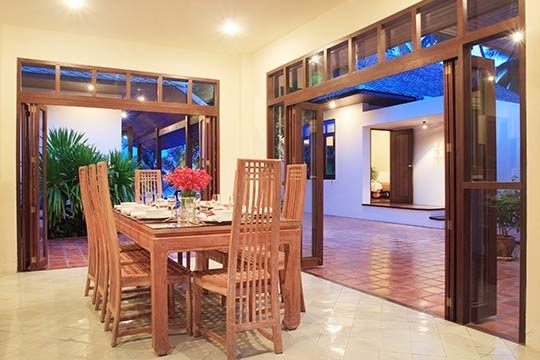 When the weather is fine, outdoor dining is a fabulous way to fully appreciate this villa's stunning location and the two live-in staff (manageress and handyman) will happily move the dining table to the pool or beachside for alfresco meals. A basic continental breakfast is included in the rate and the kitchen is well equipped to cope with anything from snacks to a full-scale dinner party. With three restaurants close by and the option of hiring a private chef (modest extra charge, plus provisioning), it really is up to you how much self-catering you choose to do. And you don’t need to worry about tidying up as maids visit twice a day to take care of such chores. 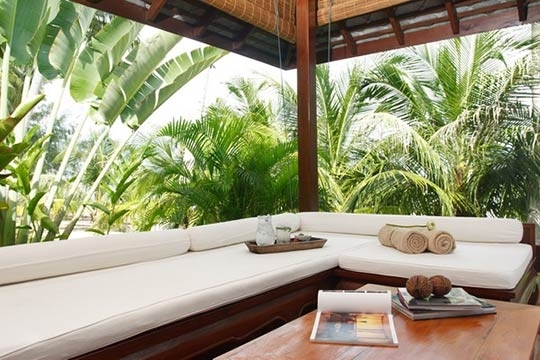 Perhaps deliberately, Ban Laem Sor is more practical than luxurious when it comes to furnishings and decor. Although this makes the villa seem a little bare when compared to more lavish properties on the island, it also makes it easily adaptable: a great spot for a long-weekend celebration, or even for an intimate wedding with guests staying nearby. 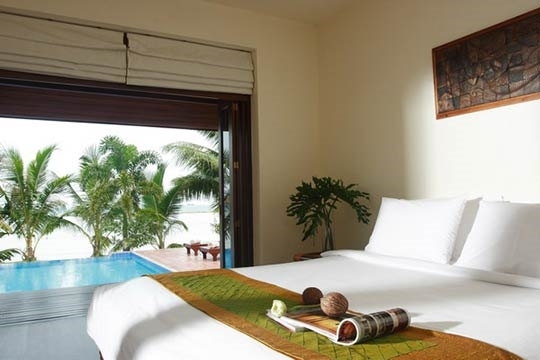 The immediate surroundings are peaceful and secluded: Ban Laem Sor is flanked by coconut plantations with very little intrusive tourist development along the beach, and is also within easy drive (car rental can be pre-arranged) of several other nice beaches and natural attractions. 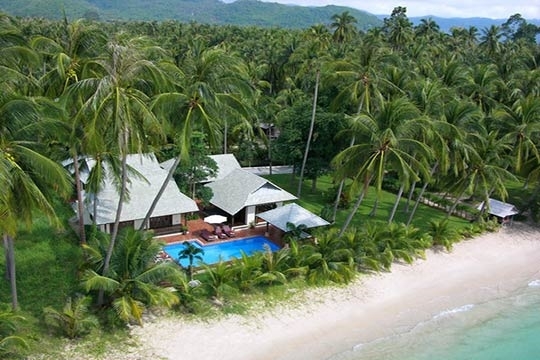 Secluded beachfront villa for families seeking a peaceful retreat. Ban Laem Sor is in a quiet, mainly residential area where small houses are scattered amongst the coconut palms. The beach directly in front of the villa is not the best on Koh Samui for swimming as low tides mean it’s very shallow for much of the year, but it's secluded and picturesque. 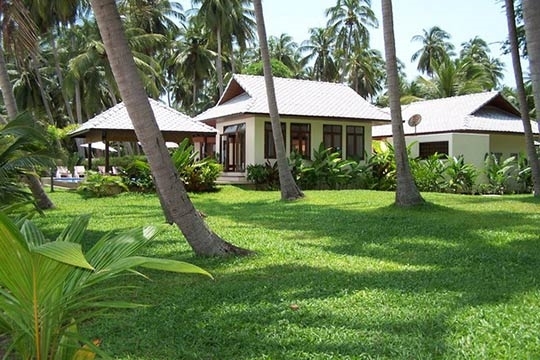 Yoga Thailand, a small resort/retreat is right next door and offers yoga classes, massage and healthy food. 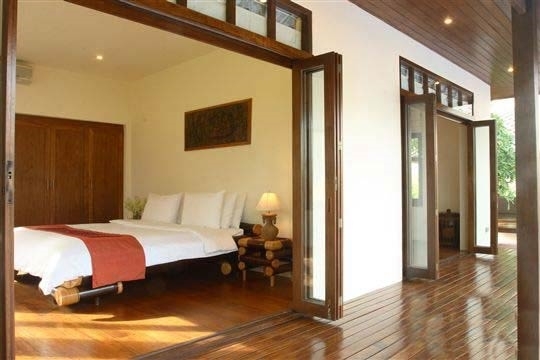 A ten-minute walk through the village brings you to Easy Time Resort which has a good Italian restaurant, and a small lane from there leads to Mordin, a rustic but celebrated Thai eatery. The nearest cultural attraction is the Laem Sor Pagoda, two kilometres away. Steps lead up from the parking area to a covered entrance that opens onto a central courtyard built around a large shady tree, which extends through the centre of the property and down to the pool. An open-sided, well-equipped kitchen and small utility room lie to the right of the courtyard, serving an indoor dining area furnished with a dining table and eight high-backed chairs. Across the courtyard are two of the four bedrooms (one queen- and one twin-bedded). These rooms have wooden floors and French windows and are both comfortable and quiet. 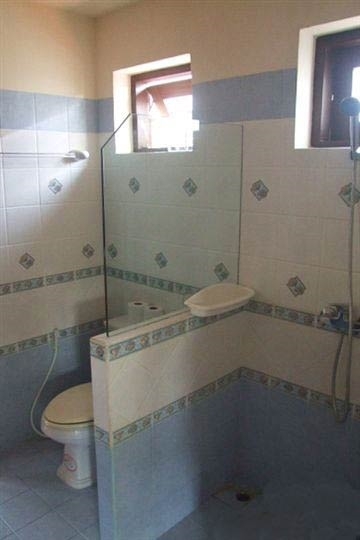 They share a connecting bathroom with shower, so would suit older children or friends sharing. Directly in front, a second pavilion houses two king-bedded rooms. Both boast sea views and fold out onto a small wooden deck that steps down to the pool terrace. Each of these bedrooms has an ensuite bathroom with shower. None of the bedrooms has a TV, but all are air-conditioned. Across the courtyard, towards the beach, the lounge is housed in a separate wooden pavilion overlooking the blue-tiled, L-shaped pool. 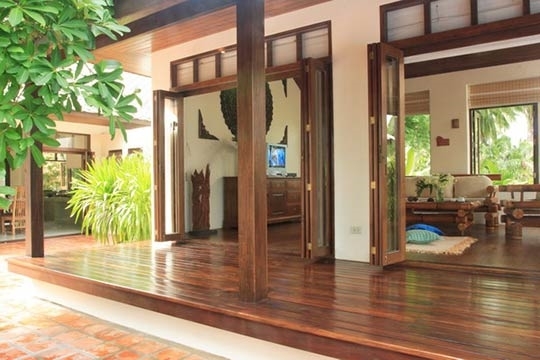 On two sides of the lounge wooden-framed folding doors welcome in the gentle sea breezes. This room is furnished with two sofas topped with bright scatter cushions, a coffee table, a chest of drawers and a flat-screen satellite TV with DVD/CD and external speakers (which can be moved outside for parties). Just beyond the lounge is a comfortable beachside <i>sala</i> furnished with a large L-shaped sofa and two cushioned planters chairs. Bright beanbags can be used either indoors or outdoors for relaxed seating. A generous terrace surrounds the infinity-edge pool, topped with comfortable sunbeds. More sunloungers sit below a row of coconut trees (which also shelter the villa from passers-by) on a small lawn fronting the beach where, at night, garden and pool lights create a relaxed ambiance. The lawn to the left of the villa is an ideal location for intimate functions. Guest WCs and a shower have been recently added in this area, so facilities in the main house won’t be disturbed. 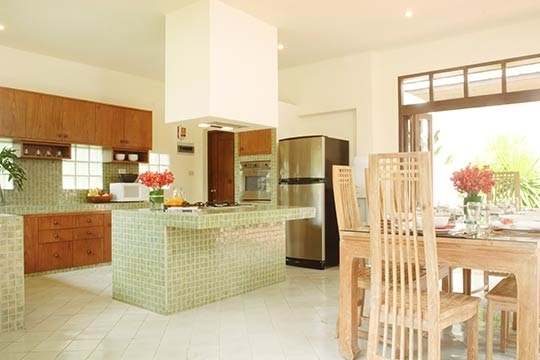 Lower rates are sometimes available for this villa if 3 bedrooms will be used. Contact Customer Service for details. 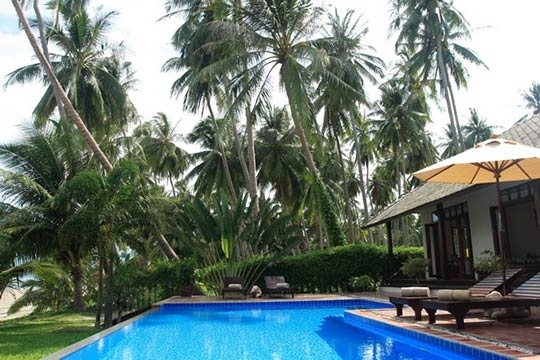 4 bedroom villa located in Laem Sor, Koh Samui. Ideal for Beachfront, Body and soul, Bring the relatives, Kid friendly, Fair share for groups, The great outdoors, Party pads, Sensible for seniors, Room with a view. 7 out of 10 based on 3 user reviews.